A fun incentive for learning touch typing! The typing pet verbalizes the keypresses, creating a wacky and engaging audible typing experience. Complete typing lessons to train your pet and earn coins. 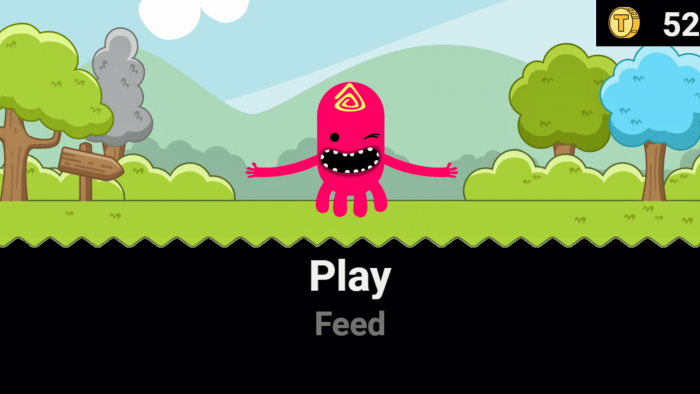 Spend coins to feed your pet and play games. Typing Pet – Accessibly train, feed & play with your pet while learning to type! Okay, this is where things get real for Typio Online. Students, teachers and the Accessibyte devs all agreed some games would make Typio even more fun than it already is. But developing non-visual typing games isn’t an easy process. So many pre-existing typing games are the all the same thing…type a word as fast and accurate as you can. Isn’t that the same goal as the typing lessons? Standard typing programs may rely on visual themes for keeping students engaged during these games but that doesn’t quite work for blind or visually impaired users. So it was determined any sort of games in Typio would need to be audibly engaging and different than just typing words quickly and accurately. With that in mind, the Typing Pet was born! Typing Pets are unique and customizable little creatures. Students can change the visual and audible components of their pet by earning coins through typing practice, then spending those coins on various games or snacks for their pets. Each pet is given a unique personality, voice and description which students can check at anytime. Best of all, the Typing Pets are a catalyst for all sorts of games. Once a Typing Pet has hatched, students can train it. This enforces practice of the Progress Mode, Lesson Practice, Mini Review and Custom Lessons, all while the Typing Pet is on-screen verbalizing the keypresses students make. At the end of the training lesson, students are awarded coins to spend on their pet. Each training mode offers a different number of coins. If students just need a few coins, they can knock out a couple Mini Reviews. If they’re saving up for one of the expensive Typing Pet treats, they may want to do a Lesson Practice training. Within the Typing Pet, students can access the entirety of Typio, all while having fun with their pet! One of the primary incentives of the Typing Pet is to feed it. These things love food. Each item you feed your pet results in a different attribute being changed. Want your pet’s voice to be deeper? Feed it a couple protein shakes! Prefer a higher pitch? Hot tea is what you need! Students can change their pets arms, legs, mouth, body, eyes, accessory or name all through feeding it. Once a pet is fed, the student is presented with an audible description of what has changed. They can then use the Check option to hear all about the pet’s personality and physical traits. Did you know my current pet’s motto is “I’ll do it tomorrow” and he loves fishy pizza? What a weirdo! This game is the same as the standard Typio Explore mode. The difference is the pet being present and voicing the keys. Try typing a few characters and check out how your pet sounds. Hold a key down and listen to the pet go crazy! 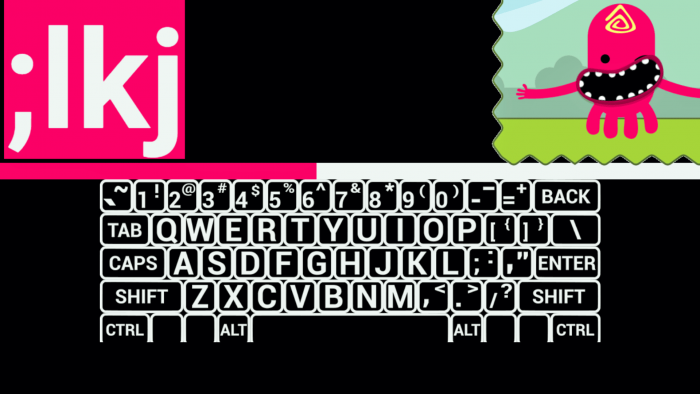 This gives students a chance to easily engage with the keyboard in a fun way without any pressure. It’s not long before students have learned quite a few keys on the keyboard. Hot or Cold chooses a random key the student has learned in Progress Mode and has them find it. As they press the keys they hear if they’re getting warmer or colder. Once the round is over the student is presented with how many keys they found before they ran out of strikes. The kids really love this game! Similar to Hot or Cold, Pet Race relies on only keys the student has already learned. Two keys are chosen and presented to the student. After the race countdown, the student must alternate between those keys to make their pet race to the finish line! The quicker you type those keys, the better your time. Typos will have your pet fall behind, so accuracy is still important. Once the race is done, students are presented with their time and are told if they have a high score. Another way to engage with the keyboard stress-free is Typio Idol. This game has your pet on stage, singing to the music. Students can press any keys to make their pet ‘sing’ along with the music. The only objective is to have fun…and maybe a couple laughs! Since Typing Pets are so customizable, there’s a lot to keep track of! Students can choose the Check option to hear the pet’s name, a brief description and their pet’s motto. All of these details are customized based on the training, feeding and playing the student has done with their pet. Non-visual users can get extra details on their pet’s physical characteristics by pressing a single key. Not too shabby! Wow, that was a lot of info! 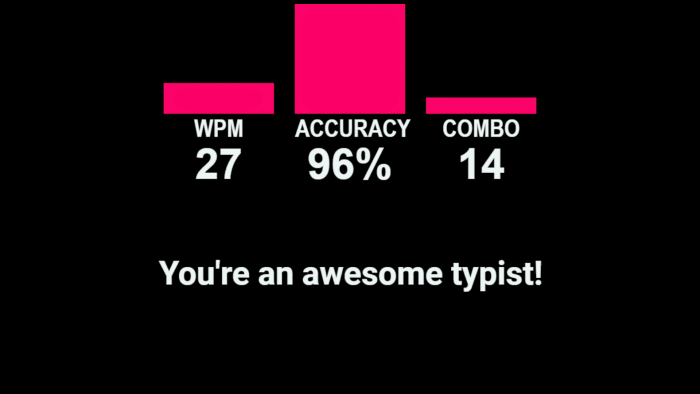 The Typing Pet has taken Typio Online and launched it into the stratosphere of fun! We can’t wait to share even more Typing Pet fun with Typio users in the future…but those details are top secret for now. You can check the Accessibyte Online product page and our Knowledge Base for the details we can share. Happy typing! Progress Mode: Fully guided training and coaching. Lesson Practice: Review lessons or create your own! Free Type: A real world test of typing skills. Explore Mode: No pressure keyboard familiarization. Mini Review: A fast and fresh way to practice. Charts, tables and graphs detail student WPM & Accuracy as they learn to type. See which lessons students have completed. Generate reports on student progress from any date range. Set goals for your students remotely. Send custom typing assignments to your students! Set words-per-minute and accuracy goals for your students. Tweak program and accessibility settings. Student progress is automatically saved and loaded. Student settings and progress go with them wherever they login. Designed to be fully audible. Voices aren’t just tossed on top of a visual program. Designed for low vision users. Colors, text sizes and a logical visual layout keep things distraction-free. Simple design! Menu and interface are easy to navigate with or without vision! Uniform sound cues help guide students through the program. Plus all sorts of fun and weird sound effects! Designed and developed by a blind rehabilitation instructor (MSEd., COMS, CVRT, CATIS). Tested by TVI’s and other Special Education teachers! Student accounts are the same as individual accounts, except they are activated by a teacher and then show up in that teacher’s dashboard. Whether that’s 1 student or 100, it’s as easy as pasting the license number into the activation field! Individual accounts have full access to Typio but won’t show up in a Teacher Dashboard. This is a great option for individuals not working through the standard classroom environment, adult users or instances where teacher access just isn’t needed. 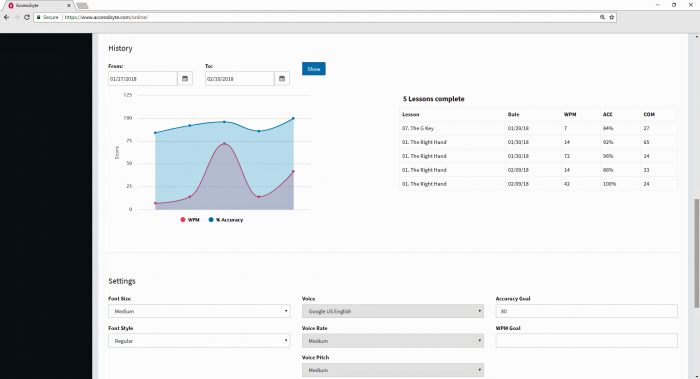 If you’re a teacher who needs to monitor student progress, generate reports on student performance and send your students lessons, you’ll need a Teacher Dashboard license. From within your dashboard, you can activate any number of student licenses to create your caseload. -Add as many students as you need to your dashboard. Send custom assignments to students from anywhere. Monitor student progress by checking scores and dates of assignments. Generate detailed reports for each student. Tweak student settings remotely in case they need a little help. How is Accessibyte Online accessed? Accessibyte Online is a Software as a Service (SaaS) which allows individuals, students and teachers to login from the Chrome browser to use their favorite Accessibyte software. Once a license is purchased, the user creates an account. From that point on, they can log into their account anywhere, anytime to pick up right where they left off. This is great for allowing students to use their accessible software at both school and home. Each license grants access for 365 days. Users who wish to continue accessing Accessibyte Online can purchase license renewals to keep going for another 365 days. No installation is required for Accessibyte Online users. Better still, no outside screen reading or magnification program is needed. Everything is built into the program! Simply type in your username and password, and you’re good to go. A hardware keyboard (USB, Bluetooth or integrated). Google Chrome internet browser (Internet Explorer, Firefox and Safari are not supported). Network firewall and content filters must allow HTTPS access to https://www.accessibyte.com. Gain access to Typio Online for 365 days. This will provide you with a license you can use to register either a Student or Individual account. No subscription necessary. If you want another year, simply renew your existing license. Gain access to the Teacher Dashboard for 365 day. You only need a single Teacher Dashboard license to manage an unlimited number of students. No subscription necessary. If you want another year, simply renew your existing license. Teacher registration info. I’m a teacher. How do I get started using Accessibyte Online?